Like last year’s Free Birds, in which enterprising turkeys build a time machine and attempt to stop the first Thanksgiving, The Nut Job feels like an archly contrived excuse to justify the groaning pun of the title. The story of an eccentric squirrel who gets involved in a elaborately planned bank robbery, it’s a high concept that offers low entertainment. 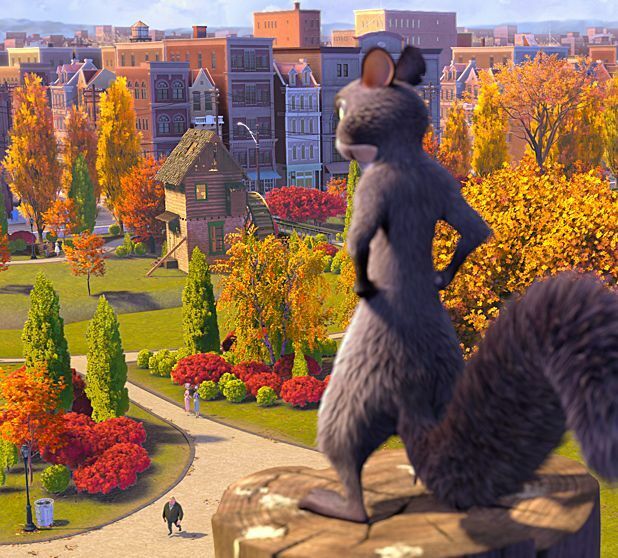 Will Arnett provides the voice of Surly, a squirrel who lacks respect within the Liberty Park community he inhabits, mainly due to living in the shadow of the more charismatic Grayson (Brendan Fraser). Surly’s accidental destruction of the annual nut harvest leads to him being unfairly ostracised by tribal leader Raccoon (Liam Neeson) and cast out of the leafy park into the big city. But chancing upon a gang of crooks organising a bank heist from behind the cover of a nut shop, Surly discovers a potential reservoir of treats that could end the squirrels’ famine. Can Surly liberate the precious nuts and stop the criminals pulling off the robbery? The Nut Job’s existence is largely due to the enduring popularity of the lovably nut-obsessed Scrat character in the Ice Age films, but opportunities for such simple Tex Avery-style humour are largely unrealised by this bluntly animated and over-complicated adventure. Expanding his own 2005 short Surly Squirrel, writer/director Peter Lepeniotis pulls together an oddly outdated 50s gangster B-movie vibe that’s unlikely to ring bells with any age group, while falling back on violent slapstick and weary pop-culture references, including two full renditions of Psy's Gangnam Style. Featuring a full range of nut-related jokes that are likely to provoke allergic reactions in all but the most undemanding audiences, The Nut Job’s box office success (and proposed sequel) illuminates nothing more than the public’s currently insatiable appetite for animated fare of any quality. General release from Fri 1 Aug.